Distributed By – Pickwick International, Inc.
Playgrounds - The original cast of ZOOM! 1. An album of 16 of your favorite songs sung by your TV friends! 2. The PLAYGROUNDS Book with words to the songs, a story on how the record was made, loads of photos, riddles and games! 3. A Jumbo 24" x 36" Poster of the PLAYGROUNDS Gang. 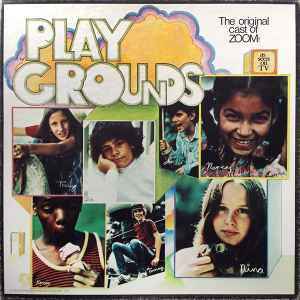 PLAYGROUNDS is not sponsored or associated with the ZOOM Television Show, which is produced for Public Broadcasting System by WGBH, Boston, Massachusetts.